The museum desired a way for children and adults to learn complex mathematical principles, while telling the institution's story that math can be fun with great relevance to our every day life across a diversity of cultures. Working with MoMath and Moey Inc., we designed two exhibits to foster the discovery of several complex mathematical principles. We designed the interface and games for an interactive floor display, which encouraged collaborative play and learning through multiplayer games including Sokoban, a Japanese grid game. This exhibit engaged the visitors with concepts like Voronoi and the Traveling Salesman algorithm. Simultaneously, we oversaw the creation and fabrication of Harmony of Spheres, an interactive sculpture employing sensors, light and sound to express musical algorithms. The exhibit incorporated our research with a composer to teach chord structure, offering a multisensory approach to learning the relationship between mathematics and music. 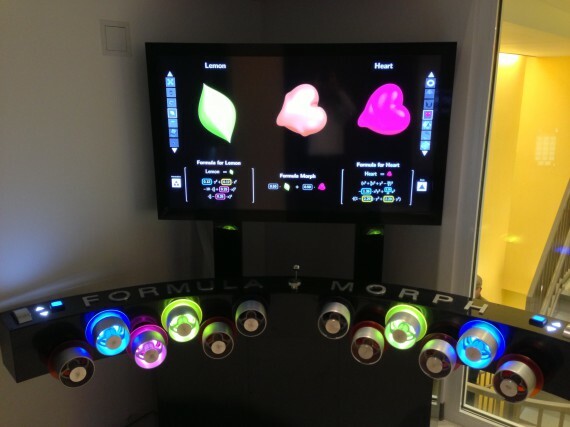 Other exhibits included Sixth Sense, Formula Morph, and the Logo Generator which allows visitors to create their own version of the MoMath logo. We built for success and longevity with an eye towards the heavy use that would result from their intuitive interfaces and approachability in a high traffic institution. Our resulting installations exceeded the complexity and technology of any other math or science museum.